Amon Amarth have released a short video teaser which features new music. The band previously launched The Berserker Is Coming website asking fans to choose their side between King and Vikings, while also teasing several posts on social media. Now the Swedish outfit have shared a short video showing Vikings on the march with a snippet of new music and revealed that we can expect the full announcement tomorrow (March 20). They've also opened another website titled Raven's Flight, which contains images and lyrics to the new song. 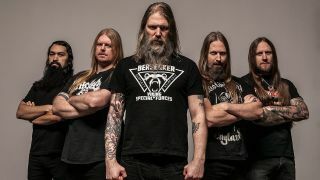 In January, vocalist Johan Hegg gave some more insight into the material, and reported that unlike 2016’s Jomsviking, the new record won’t be a concept album. He told Revolver”: “Jomsviking turned out so well, so if you then start working on another concept album and try to top that, it would almost be impossible – unless you have a really great story lined up that you can do that with. In November last year, Amon Amarth released The Pursuit Of Vikings: 25 Years In The Eye Of The Storm which came with a documentary about the band which was produced by Alexander Milas and directed by Phil Wallis.